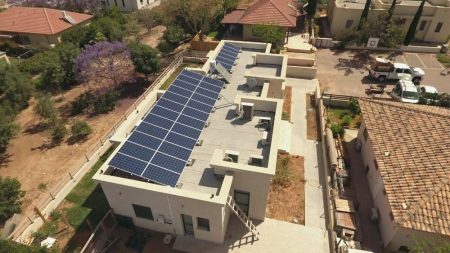 In early 2011 Inbar Solar Energy had won the tender for the construction of solar systems on the roofs of public buildings and schools in the city of Jerusalem. This system was built in June 2011 on top of the Denmark School roof in the city. The size of this solar electricity generating system is 50 KilloWatts installed. The inverters installed in this solar energy system are by SMA and the panels by Sharp. Installation was conducted on a concrete roof. The panels were installed on an aluminum construction without direct connections to the roof so as to prevent damage to the roof’s sealing. The solar system’s construction is stabilized using concrete weights so as to handle the wind load. The concrete weights are separated from the roof using bituminous sheets which prevent friction and wear of the roof.